The welcome break at home has coincided with some improved weather and certainly dodging the very heavy rain and tornado warnings from back in Waco. NFL.com has made a list of the top 100 college games coming up for 2015 and guess which game comes up on top? Yup Baylor vs TCU. 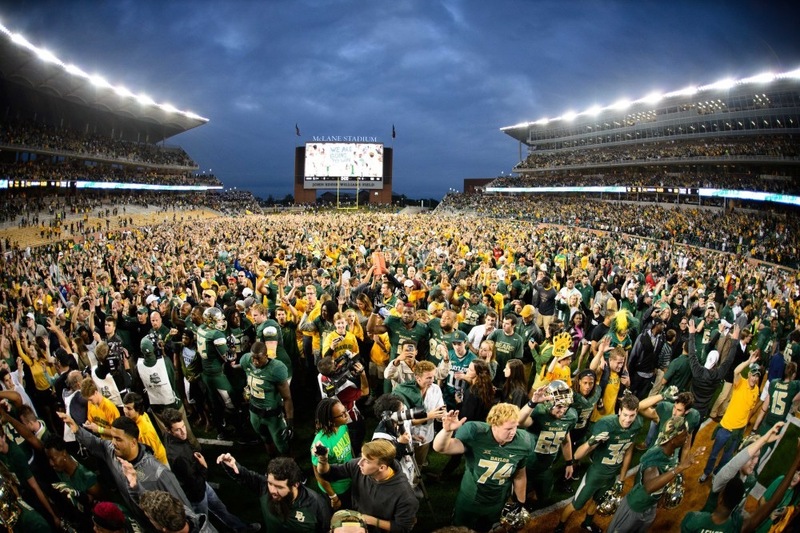 Baylor also features in a few others including #16 when they host Oklahoma but its the replay of last year's college game of the year which topped the list. Blake has already added 5lb of bodyweight and Sean has added 7. A good start for the attempt to beat all their records from last year. Can you pick out the boys in this pic? Baylor has released a 'Spring Prospectus' and review of spring ball as a preview of everything that is coming up in the Fall. You can check it out online here. If you like stats and numbers you'll LOVE this, one can only imagine how much work must go into it. All the profiles are updated as well for the players. the boys have returned home and today got their first lifting session in at the gym. Blake is the heaviest that he has been returning home from a Spring semester in his 5 years, just under 305lb, Sean is 10lb heavier than the same time last year. Training pics will go up over the next few days. The Baylor OL has been getting some praise this week. Phil Steele is a very well respected analyst and he included Baylor in his top 7 OL units in all of college football. That means he considers Baylor the best in the Big 12 conference. Dallasnews also rated Baylor's OL unit as the best in the state of Texas. Some not so great news. At least 9 people were killed in a bikie shoot out in Waco today. You can read about it here, thankfully it looks like no members of the public were killed. The place where it happened is well known to anyone wh has spent time in Waco. Blake's birthday yesterday, so over in Waco it's today. No word on how he is celebrating it, but right now they're both on schedule to finish final exams this week and head home at the end of it. The end of semester will also coincide with a chaneg of room mates. Tanner Richey, a walk on to the football program and team mate, will be moving away from Baylor whilst Keith, Sean and Blake stay on. Lastly, here is a preview of the season with interview of Head Coach Art Briles from the Big 12 Conference media department. The 2015 Draft has been completed, Baylor had QB Bryce Petty selected by the NY Jets in the 4th round and LB Bryce Hager selected in the 7th round to the St Louis Rams. Other Baylor players have already picked up Free Agent offers, Antwan Goodley to the Cowboys, Levi Norwood to the Chicago Bears and punter Spencer Roth to the Bills. A full recap can be found here. At this stage Blake and Sean will be home right after the semester finishes, so depending on flight availability they'll be back some time on Saturday or Sunday May 16th/17th. With the 2015 Draft over, it means the 2016 Draft is the next one up, and for Blake hopefully it will represent a chance to continue on to the professional ranks. The season preparation will be as it always has been however. Training efficiently, get a lot stronger and gain some muscle mass to get through the season; work on speed and agility skills like we always have. 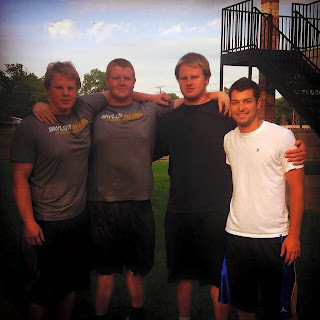 Last year Blake finished his summer training at 317lb, this year he'll probably go over 320lb for the first time. For Sean, last year he was up to around 292lb, this year we'll aim for 300lb. 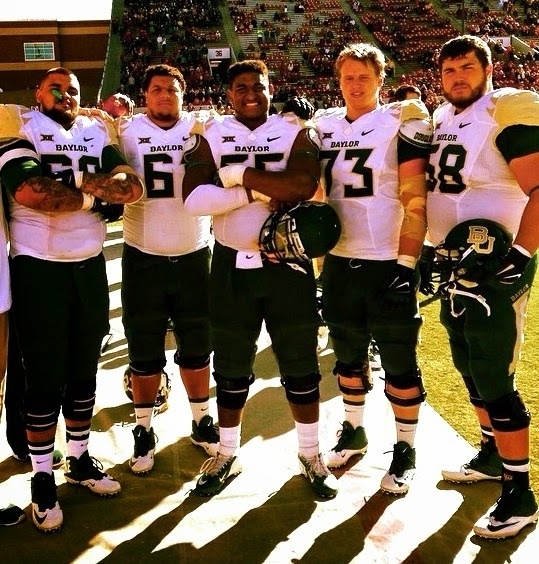 The starting 5 for the Baylor OL in 2015.